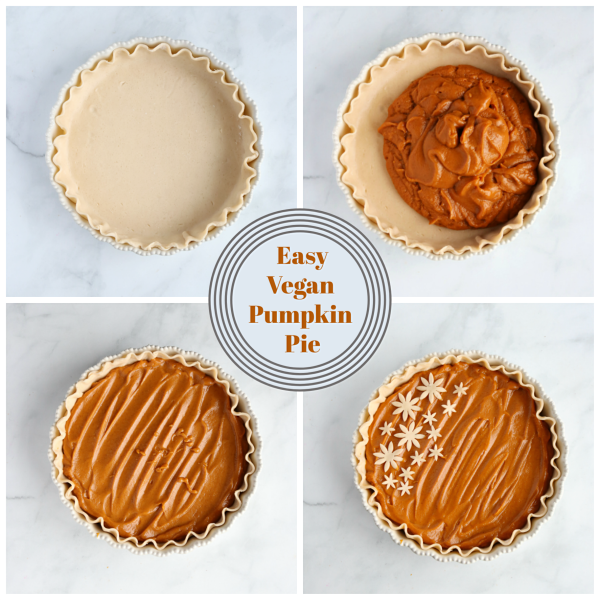 An easy and delicious recipe for Homemade, Vegan Pumpkin Pie. 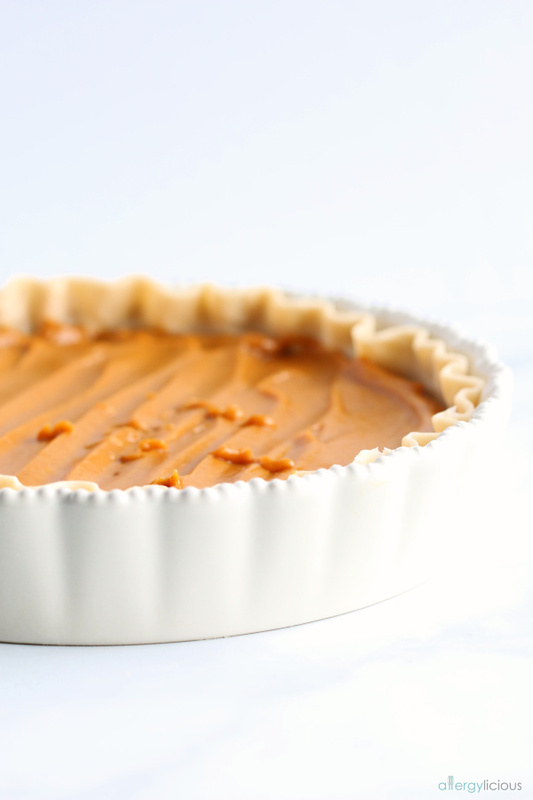 This is the only pumpkin pie recipe you will ever need and it’s perfect for the holidays! As the weather starts to cool and the Halloween costumes start coming out, I really start to crave all things Pumpkin. Pumpkin Cupcakes, Donuts, Spiced Lattes, Pumpkin Cheesecake, Pumpkin Cookies and especially Pumpkin Pie. But when I started baking to keep Xander safe, one of the first holidays we encountered was Thanksgiving, which of course, is just not the same without Pumpkin Pie! It was really hard to find a recipe that didn’t use evaporated or condensed milk and a dairy-free option of this sweetened milk just wasn’t available 10+ years ago. Thankfully, after a lot of tweaking, I was able to make my Grandma’s favorite pumpkin pie, allergy-friendly. It is now always on our table during the holidays. I love that I do not have to give up the consistency or taste just because it is dairy & egg free. Originally, I used silken tofu in the pumpkin filling which is still my preferred preference but since so many people have an allergy to soy, I couldn’t resist including our soy-free version in this post as well! So now, you have 2 options to choose from, depending on your restrictions. Isn’t that just the prettiest, pre-baked pie? And it’s super simple to make too. Simply add all the ingredients to your blender and blend away until smooth! Yep, that’s it. Just watch how easy it is…. I’m incredibly thankful that none of my family members have celiacs but my mom has gone gluten-free and I always want to make sure she can enjoy everything I place on the table. Therefore, Grandma’s recipe pie crust recipe has gone gluten-free too. It was a simple swap by replacing all-purpose flour with a 1-to-1 flour blend and you’re guests will never know the difference. But just in case you don’t want to make your own crust, there are plenty of other options out there. From pre-made roll-out dough to refrigerated or frozen pre-made pie shells, you have plenty of options . Especially if you are limited on time or just don’t trust your crust making ability. 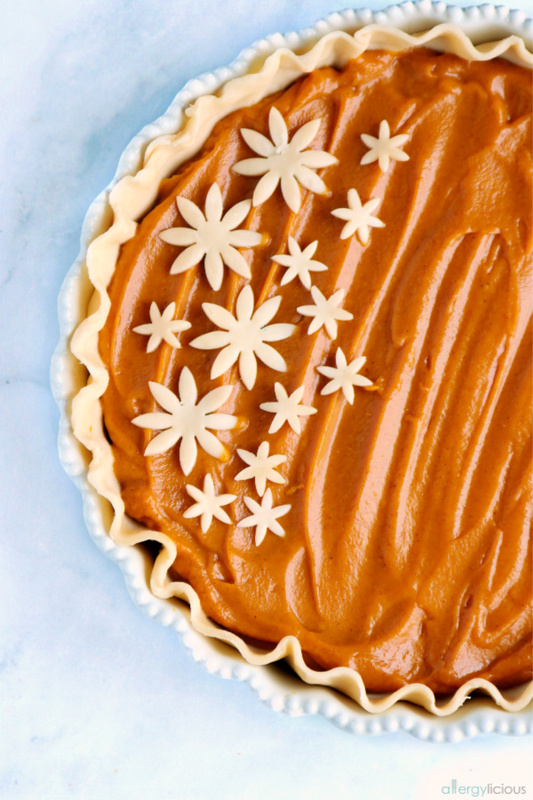 In the light of things, its about enjoying the day, not creating more work for you to do which is another reason why I love this pumpkin pie recipe. 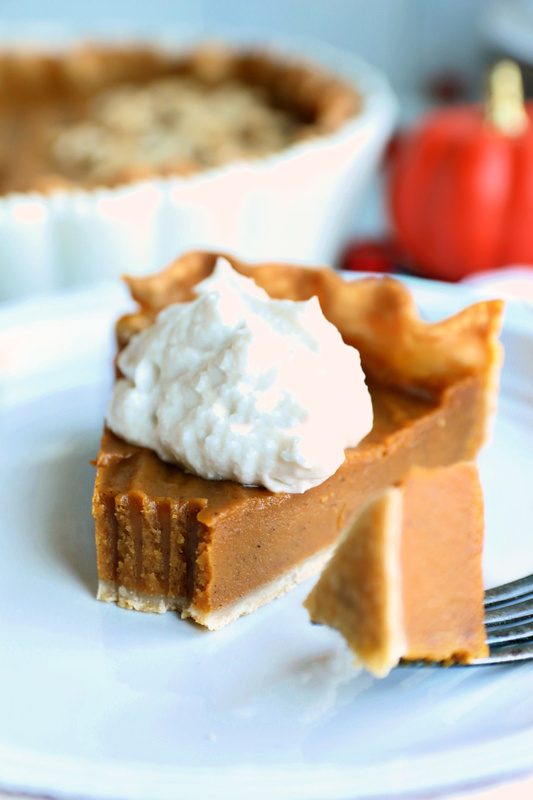 Now for the finale….how to top off your pumpkin pie and make it extra special. 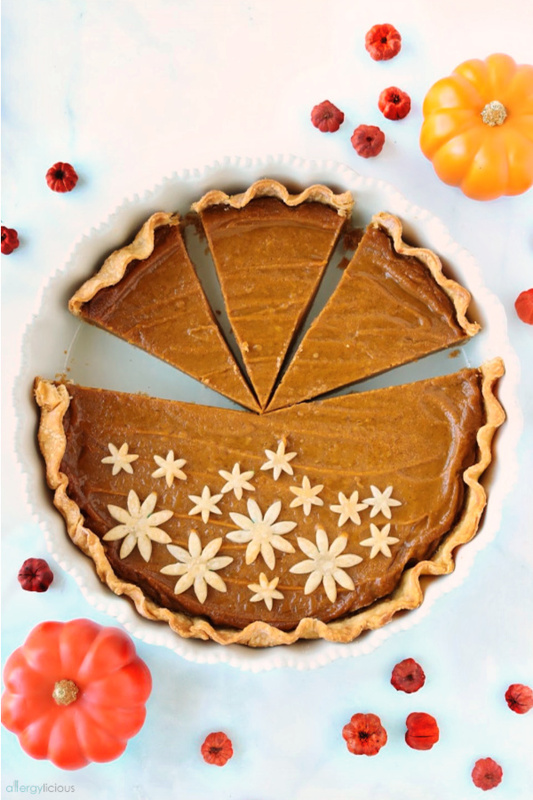 To make my dessert “pop” a little more, I like to dress up my pumpkin pie with a few cut outs from the remaining pieces of dough before I start baking. Use stars, circles, leaves or whatever shapes you have on hand. Although it’s not essential to this recipe, it does add more visual interest to your pie and makes it stand out and say “pick me, pick me”. Can you hear it? And then there’s the whip. When we first went dairy-free, there were very little options out there for whipped toppings. The only one that was fairly decent was Soy Whip and even then, it wasn’t my favorite. Today though, there are many more options out there, including canned whip made from coconut or almond milk. My favorite though, is CocoWhip made by So Delicious Dairy Free which comes in a tub. It tastes just like Cool Whip but without the allergens and is just so so good…. especially in your coffee. 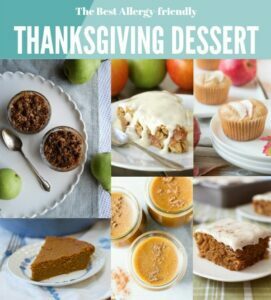 It’s a dessert worthy of serving on Thanksgiving and worth enjoying by all! Food allergies, food preferences or restrictions won’t be a problem because everyone can enjoy a slice of pie. In a medium bowl, mix flour, 1/2 tsp salt and the shortening with pastry cutter until flour is dampened. Slowly incorporate cold water 1 Tb at a time, until all water is absorbed (you may not need all the water, just enough to form the perfect, doughball). On a lightly floured surface, roll the dough out until 1/4″ thick. Life dough and lay in pie pan. Trim overhanging dough and reserve scraps for cut out shapes. Crimp sides or press down with the back of your fork5 to create decorative edges on your crust. In a blender, blend together all filling ingredients (using option 1 or 2) . Pour filling into pie shell and decorate with pie cutouts if desired. Reduce oven temperature to 350° and bake approx 40 minutes longer. **If using cornstarch version, center of pie will not be completely set when done. This will happen during cooling process. Cool completely the refrigerate before serving. Let cool completely, then top with your favorite homemade or store-bought vegan whip cream. If you don’t have Pumpkin Pie Spice you can use: 1 tsp cinnamon, 1/2 tsp. ginger + 1/4 tsp. nutmeg + 1/4 tsp. ground cloves. What will you be making this Thanksgiving season? 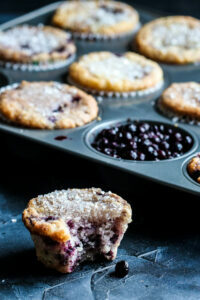 Are you baking or cooking to accommodate a special diet during the holidays? Comment below and if you’ve made this pumpkin pie, I’d love to hear which version you chose for your celebration. 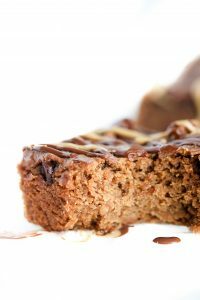 this post has been modified from its original publishing in 2011 to share new photos and updated recipe. This pie is almost too pretty to eat! I love how easy to make it is! 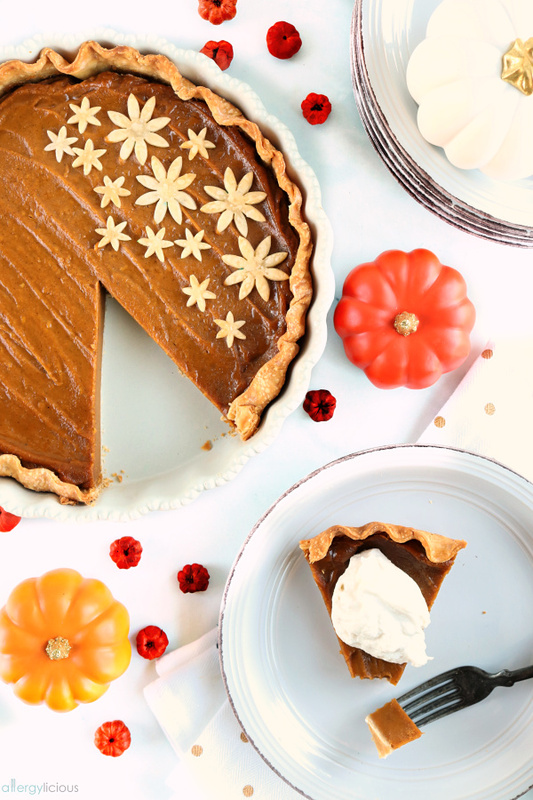 The flowers on top of the pumpkin pie are so lovely! You know how to make pumpkin pie a showstopper, and I like that this is one that EVERYONE can enjoy. That filling looks so rich Nicole, and the crust garnish is so pretty! So smart to include a couple of options too. It’s been a while since I’ve made a tofu pie since soy has been out of vogue. I need to make one again! That’s very sweet to say! Just using a few cut outs from your left over pie dough can make a huge difference. Can’t wait to see your next pie….I bet it’s delicious. I’ve never made pumpkin pie from scratch. 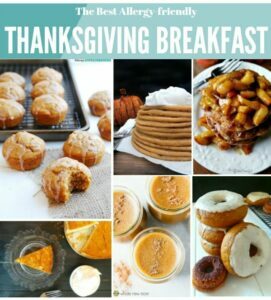 I love that this is vegan though, I might have to give it a try this week 🙂 I have a bunch of pumpkin that I’ve been wanting to use up. Thank you so much for making a soy free version! 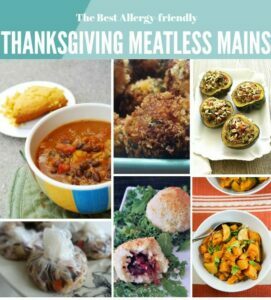 It can be really challenging to find vegan recipes that are soy free or contain another of my allergies (tree nuts). p.s. I love the little cut outs – what a perfect way to use up the extra pieces of dough. You are so welcome Kortney. You’re right, finding vegan recipes free from soy and/or nuts is hard to find, which is why I love having this option for everyone. This is a beautiful pie Nicole! Who wouldn’t want this at their table, and the texture is perfect! Thank you Sarah. Hope you get to enjoy a big slice of it. 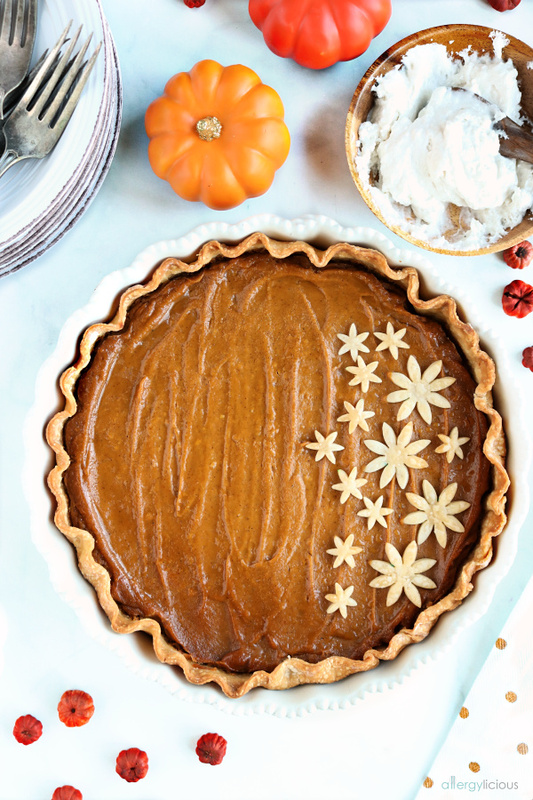 This pumpkin pie is so pretty! What a delicious vegan addition to the dessert table! This pie is absolutely beautiful! I love that it’s free of all the major allergens! I think my whole family can eat this! Thank you Monica. It’s always tricky making foods that everyone can enjoy together, so I’m glad this works for your family. Enjoy. 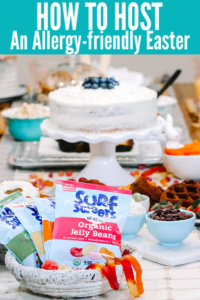 Do you really use sweetened condensed coconut milk AND 1 cup of sugar? Yes, although you can always cut the sugar in half, so use 1/2 cup if you want it less sweet. This recipe is based off of my Grandma’s recipe which used sweetened condensed evaporated milk (but we opt for the coconut version).